I’m on the uphill side of my 40s—–BARELY—but something in me is still, what—17? 23? I know, we all feel that. But I feel it. For instance, I’m a gamer. And I’m old enough to be comfortable with it. (Being comfortable with yourself—this is a thing that happens in your 40s.) Truly, I ride the commuter train to work with my Nintendo DS in hand. At first, I flinch when I see neighbors and friends, but then I realize, it is what it is. I am who I am. Years ago, my brother gave me a Nintendo GameCube for Christmas. It remains one of my favorite gifts, ever. Now I have a Wii, too. An added bonus of my interest in gaming, a holdover from my youth, is that it creates another bond between me and my kids. When I got that GameCube my son was 2, my daughter 4. They watched me hack through Super Mario Sunshine, Harry Potter and the Sorcerer’s Stone, The Legend of Zelda: Wind Waker. Eventually, something interesting happened; they started spotting the clever ways to solve the games’ challenges. When my character would run around in virtual circles on the screen because I couldn’t figure out how to get to the next level, one of my kids would say, “Mom, why don’t you shoot all those little torches with your water gun?” I’d think, "Seriously, kid. Leave the gaming to the experts." But after nothing else worked, I’d try their suggestions, and what do you think happened? Yup. They worked. The appeal of problem solving using entertaining characters in fun scenarios with a sometimes goofy soundtrack quickly gathered speed. My son, now 8, has a long wish list of Ninetendo DS and Wii games. But not Final Fantasy or Grand Theft Auto. His interest lies more in Pokemon, Star Wars and Mario Karts. My daughter, now 10, gardens with Gardening Mama and cooks with Cooking Mama. Nothing, as far as I’m concerned. I’m more worried about my kids’ snacking habits than their video game usage. They shoot hoops outside, play sports, play chess and are engaged academically. It’s all good. Video games haven’t made them obese, drooling morons. In fact, they’re both excellent logicians who possess the ability to see things that aren’t always obvious. Is this a talent that makes them good gamers? Or is this talent a result of good gaming? I’ll never know. But I do know that gaming is often a family activity. All four of us vie for Party Stardom as the winner of the Mario Party games. Guitar Hero tournaments, family Wii Boogie tournaments and Active Life Outdoor Challenge get us on our feet. It’s valuable time spent together, mixed in with—yes—board games, badminton, and other “more traditional” stuff. Gaming with my kids is not a substitute for any other family activity, it’s just another kind of family activity. My interest in their games gives me a certain level of validation among my kids and their friends. I love when my kids ask me how to beat a boss or advance to the next level in a game. I may love it even more when their friends are challenged by a difficult level: “Mrs. Gorant, can you help me beat this?” I’m all too happy to. Because I’m so involved, the kids think I “get it.” So when I say, "no" about a game choice or playing time, they understand it’s not out of ignorance, but knowledge. Ultimately, although I enjoy gaming with my kids, and connecting with them and their friends on a youthful level, I’m not a friend, I’m a parent. But how great is it that I can scale the wall that develops between adults and kids and give them a little wave hello? 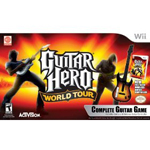 Guitar Hero World Tour ($75, with guitar) Somehow the Beastie Boys’ “No Sleep Till Brooklyn” has become my baby boy’s favorite riff. He and his sister fight over who’s best at “Livin’ on a Prayer,” but as far as I’m concerned they ain’t got a prayer when Mama steps up to “Are You Gonna Go My Way.” Side note: The husband thinks my body language is too suggestive when I rock my axe. The kids play with the appropriate measure of concentration and the occasional tongue sticking out. 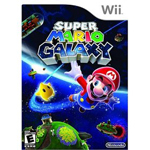 Super Mario Galaxy ($50) This is a play and watch scenario, one of the rare times I am playing a game at least one of my kids have finished. My son loves to watch me play, like watching iCarly but with running spectator commentary: “Whooaaa this is a cool one.” “Oh, I remember this one, it’s sooooo easy.” It’s payback time when I have to ask him how to wax the giant fish. “Want me to do it?” No thanks, kid. I’ve got it. 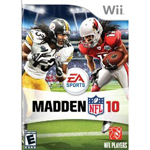 Madden NFL 10 ($60) My son has never played nor watched football, but he is learning the game via Wii. I plan to fulfill many a sports widow’s wish—learn football…by playing it. Against an 8 year old. Will I dominate? We shall see. another game you might like is wizard101.com. i play with my 8 year old; her 9 year old friend is always asking me to help him beat bosses! i agree, the gaming doesn’t get in the way of running around outside, digging in the dirt for bugs, swimming, riding bikes or scootering. and i meet lots of adults in the game playing, and they all started becuz of their kids, and then got hooked. Ruth…I’ve seen the ads for that one; unfortunately the commercials didn’t drive me to it, but on your recommendation I’ll definitely check it out! there is also a very helpful fan site called www.wizard101central.com. it has good info. about how to play the game, and you can meet other adults to play with if you get tired of all the nonsense from the kids LOL! i stopped playing for a while but have gotten addicted again.